I write this blog about Darfur to my three children, Boston 6, Capri 3 and Cayman 2. My desire is that through my writing, they can know me, know the world and learn how they can achieve anything in order to change it. To the reader, I hope by giving you a transparent look into our lives that you may learn something about yourself in order to help heal the world. As I write this, I wonder where you will be when you read it, how old you will be, and what your lives will be like. I wonder what the state of the world will be when you read this. One thing I know for certain, you are reading this at a perfect time and place. Even if it isn’t your first time, you are being called to read it, and there is a reason why. One of my deepest desires is that this can be a real positive source in your life; a place where you can come for learning and healing. Healing has been on my mind lately. I know for me personally, I have had a lot to heal over the years. The last four or five years have been actually quite challenging. Definitely the most challenging and trying times in my life; however, I am so grateful for the wonderful forms of healing that have come my way. Boston, when you were 5, I went through one of these difficult times, and I decided to spend every morning walking and watching the sunrise. I don’t know how it happened, but you wanted to come with me every morning. It was cold and it was early, yet you came with me, helping me heal – you saved my life. As humans, we always have opportunities for healing. In this moment, I am sure there is an opportunity to heal internal wounds for you. I hope these words can help be a catalyst for your healing and that you can take the steps to be healed. 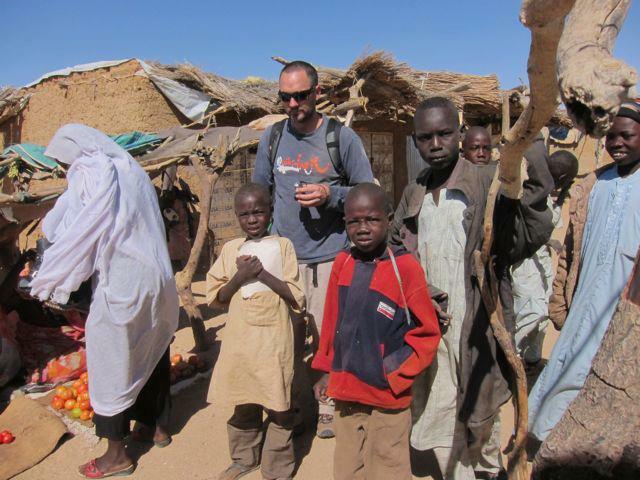 With Darfur, there is a serious amount of healing to be had. They are such harsh circumstances and even after visiting half dozen camps, meeting many refugees and knowing so many stories, I still can’t even comprehend the healing that must go on. On a global level, the world is in much need of healing as well. The fact that this genocidal conflict has gone on for ten years shows the state of pain that the rest of the world must be in. It’s in such a state of pain that we are paralyzed in our efforts to help end the genocide in Darfur. A Buddhist monk named Thich Naht Hanh has written that with true service, it difficult to see who is serving whom. During this exchange of service, both of the parties are being healed and being healers. You can’t have one without the other. Whatever your pains, whatever your sorrows, I invite you to become a conscious healer and allow for your own self-healing. My trips to Darfur have always come at the heels of my biggest struggles in life, and both trips gave me incredible strength and healing. And as I’ve been healed, I only hope I have made a difference for one of my brothers or sisters there. The world is in an interesting place. Millions of people are suffering from the most extreme horrors that can ever be imagined and here in the western world, we have our own sufferings. Yes, they are remarkably different, but healing that is needed nonetheless. If only we could see how in this cosmic dance of humanity, how these two parties could come together, heal one another, and create such a cosmic shift that it actually does change the world. I love you. During those dark moments of your life, take a deep breath, look around and be a healer and your heart will be healed. Jeremiah is a social entrepreneur that has a deep love for humanitarian work. His goal is to connect humanity through socially conscious business models that change the world.